The 13-year-old found he had a lot of learn about some recent history before tackling the role. "Extremely Loud and Incredibly Close"
For 13-year-old actor Thomas Horn, the film "Extremely Loud and Incredibly Close" represented not just his first major acting role but also a chance to learn about some very painful recent history. He was only three when the World Trade Center was attacked, so Horn had to research the events of 2001 in preparation for playing the character of Oskar Schell, a young boy whose father died on 9/11. Horn even met with families who lost loved ones on that day. "It really made a big impact on me," says Horn. "In a way that's what made 9/11 real for me. I don't remember the day, I don't really hear about it that much in my normal life, but meeting those people made me realize on an emotional level the tragedy so many have gone through." Horn only had a school play and an appearance on "Jeopardy!" 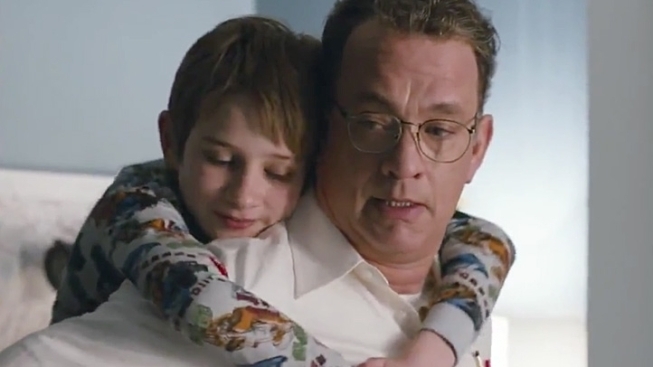 kids week under his belt before finding himself starring alongside the likes of Tom Hanks and Sandra Bullock in the adaptation of the Jonathan Safran Foer novel. Actress Sandra Bullock, the star of "Extremely Loud and Incredibly Close," gushes to iVillage about her new movie and her adopted son. She tells other moms to "savor every moment." "I would go into this little room the director had built for me off-set, and I would think about how the character would feel," reveals Horn. "I would maybe do this for 15, 20, 30 minutes. Eventually I felt the character had entered my body and that I had left." Horn has already won a Critics Choice Award for his role and may very well be in the Academy Award conversation when those nominations are announced next week. Tom Hanks and co-star, Thomas Horn, hit the red carpet for the premiere of "Extremely Loud and Incredibly Close" in New York City where they chat about the movie's father and son story.